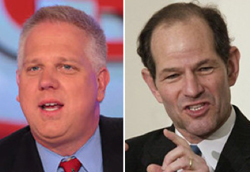 Glenn Beck had some choice words for his former employer CNN — and for its newest talk show host, Eliot Spitzer — during a talk he gave Saturday to a group of radio executives. Speaking at the Talk Media Conference in Marina del Ray, Calif., Beck sarcastically called CNN “the king of risk,” according to the Hollywood Reporter. He then acted out a mock conversation between CNN executives who confused Paula Zahn with Campbell Brown. “I think they’re the same people,” Beck joked. But Beck saved his harshest words for Eliot Spitzer, who began co-hosting “Parker Spitzer” at the beginning of October. He said that, had CNN put “a guy who frequented hookers” on the air by himself, it would have represented a real change.